Thanks to Bill Walsh for capturing many of these excellent images. It’s Monday morning (a little more than a week ago) and 43 people are locked inside a gate that surrounds and protects SARA Church and New Missionary Bible School in Kathmandu, Nepal—just 100 miles from Mount Everest. Surrounded by towering mountain peaks, we are in the bowl of the Kathmandu Valley, only 4,600 feet above sea level. Heaven is coming near. Tej Rokka, a handsome Nepali pastor, is standing waist deep in a pool; his youthful face betrays his 42 years only in the deep wrinkles around his laughing eyes. Six young Nepalis—all in their teens and 20s—stand in line while the rest of us lift our voices in song. One by one, Rokka receives six new believers into the pool, prays, and baptizes each by immersion the name of the Father, the Son, and the Holy Spirit. Just 50 short years ago, Prem Pradhan (1924–1998) did the exact same thing in Nepal—and was locked against his will inside a quite different gate. Since 1970, Christianity in Nepal has been growing faster per capita than anywhere else—not only South Central Asia (see graph), but in the world. Pradhan is part of the reason why. 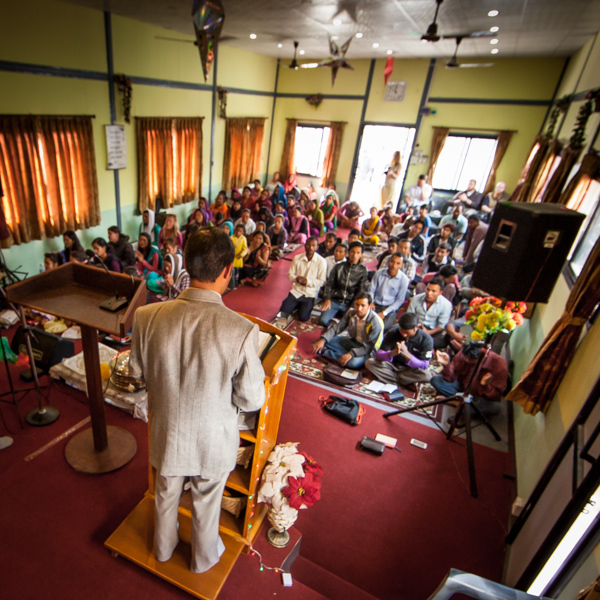 Christianity is growing in Nepal at nearly 11 percent per year. 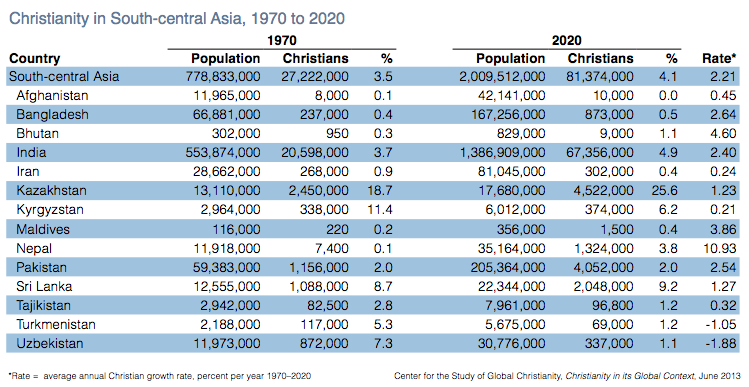 From just 7,400 in 1970 to more than 1 million today, the projected number of Christians by 2020 is 1,324,000. Born into a Hindu family, Pradhan served as a Gurkha warrior in the British Air Force until a gun wound left him with a lifelong limp. In 1951, he encountered an Indian street evangelist and trusted Christ. At the evangelist’s recommendation he read the New Testament six times, eventually becoming a full-time evangelist himself. Pradhan was imprisoned 14 times in Nepal between 1960 and 1975 for openly baptizing Hindu converts. While in jail he preached Christ to his cellmates and jailors, and saw dozens come to faith. He never wavered in his call to evangelism. 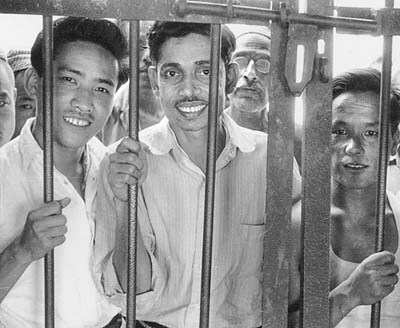 Prem Pradhan (center), along with Bir Bahadur Rai (left) and Dil Bahadur Thakuri (right) held in Tansen prison for their Christian faith (1961). Pradhan’s lasting legacy includes three Christian schools: the first, in Kathmandu, was brutally shut down by a police raid in 1972. The second, New Life School in southern Nepal, continues to serve many orphans in rural villages today. The third is Glenhill School in Darjeeling, India. Pradhan died on November 15, 1998, and is buried in Sarlai, Nepal. Many graduates from Pradhan’s schools have entered Christian ministry in Nepal. Pastor Tej Rokka is one of them. Growing up in a poor Hindu family in a village near Everest, Rokka experienced tragedy early on. “When I was just 5 and my brother was 2,” he says, “our mother died.” Living in desperate conditions, a friend recommended to the boys’ father that he send them hundreds of miles away to Pradham’s New Life School. So they went. “It was a home for us, not just a school,” Rokka recalls. “That was where we both came to the Lord, and where God grew in us a heart for this ministry.” He speaks fondly of Pradhan, the schooling he received, and his conversion to Christ as a youth. Now Rokka has a son attending Glenhill in Darjeeling, India. 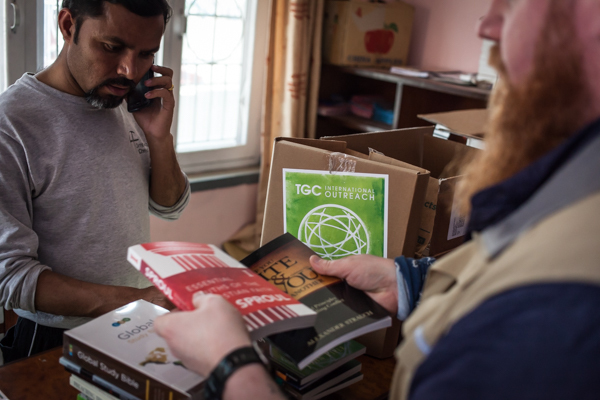 Through TGC’s Packing Hope ministry, thousands of copies of gospel-centered books have been distributed throughout the country, including newly translated Nepali editions of John Piper’s Seeing and Savoring Jesus Christ, 50 Reasons Why Jesus Came to Die, and The Dangerous Duty of Delight. Every student in the New Missionary Bible School receives copies of each book. Rokka mentions that 50 Reasons Why Jesus Came to Die is a favorite evangelism tool with students and many pastors in Nepal. “These books, and ES4M’s biblical coursework, are so helpful for our students,” he tells us. A wonderful example of a next generation leader is Manoj. Just as Rokka was trained by Pradhan, Manoj is being trained by Rokka. He arrived at the orphanage at age 6 and now serves on staff and teaches at the SARA Children’s Home. He’s also a student in the New Missionary Bible School. “I love to learn and teach the Word of God,” Manoj says with a smile through a translater. He daily teaches his students using ES4M’s adaptation of Walk Through the Bible, and also helps lead worship in SARA Church. Manoj is a future leader of the church in Nepal. A Glimpse into Theological Famine Relief in Nepal from The Gospel Coalition on Vimeo. And watch this five-minute video to meet Rokka, Manoj, and Michael Heitland with ES4M. Equipping Saints in Nepal from Agape Visuals on Vimeo. Prem Pradham – Learn about this heroic leader in an introductory article. SARA Ministries – Read Tej Rokka’s testimony and discover more about this ministry’s work. 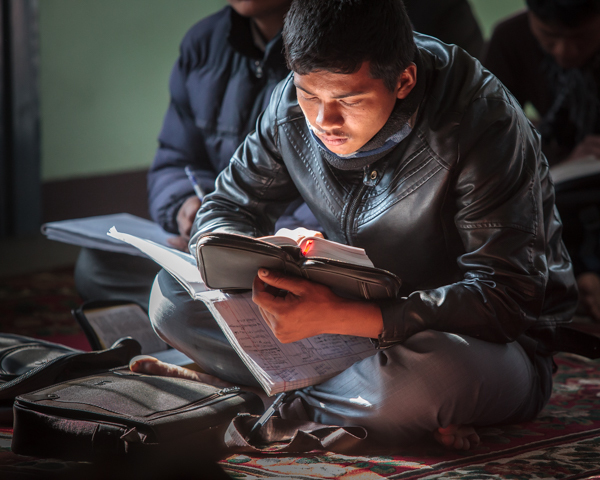 Equipping Saints for Ministry (ES4M) – Train leaders in Nepal. AgapeVisuals.com – Photojournalism team Jordan and Cassie Timpy are donating a year of their life to telling global stories. TGC International Outreach – Read about TGC’s mission of Theological Famine Relief. We have at least two more Relief Projects planned for Nepal this next year. E-mail [email protected] if you’d like to help partner in this work. Dan Olson is the director of Spreading Hope Network, kick-starting new God-centered schools for children of the city. He is also a board member at Hope Academy. He is the co-author of Oh, the Treasures You’ll Know: a Dr. Seuss Parody, and illustrator of The Boy Who Cried Over Everything, The Girl Who Got Out of Bed, and Why Can’t I have a Cupcake? He previously served as director of donor ministries for The Gospel Coalition. He lives in Minneapolis with his wife, Lucy, and their four kids, where they help lead children’s ministry at Cityview Church. You can follow him on twitter.